A large white envelope arrived in our mailbox yesterday. 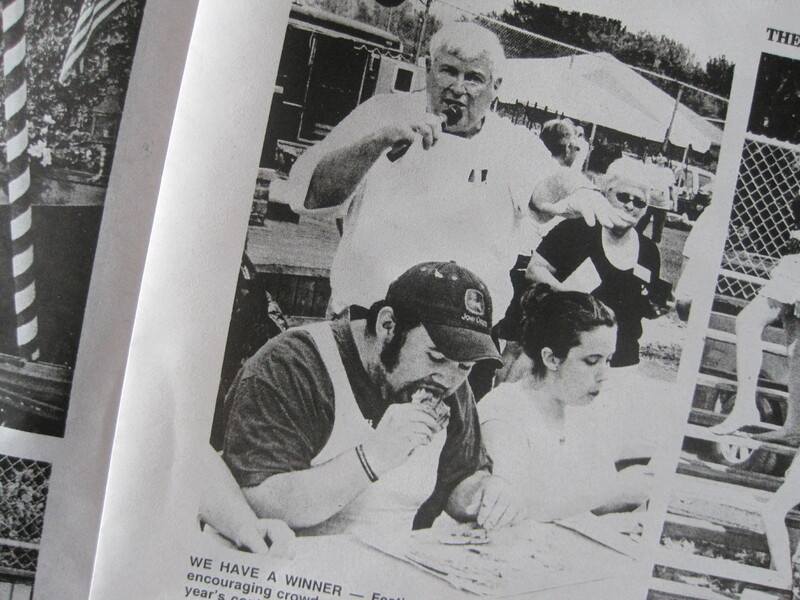 Our friend, Susan, sent Il Bollettino della Piccola Italia, The Little Italy Bulletin for us to check out and enjoy. We were expecting a flier or an announcement in the local newspaper, but no . 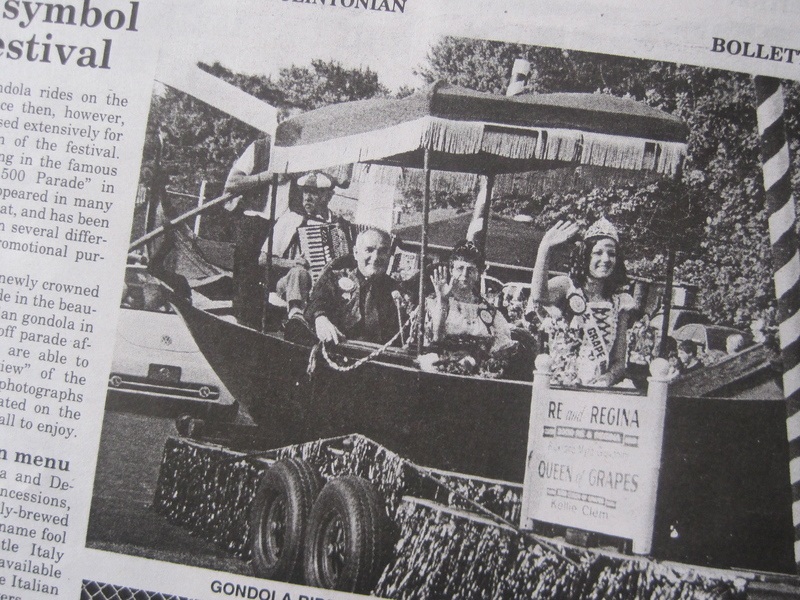 . . instead we got the special supplement to The Daily Clintonian newspaper—a full 32-pages, recapping the events and festivities of the 45th annual celebrazione, celebration of the Italian heritage enjoyed and shared in that special mid-western town. Twenty years ago we moved our young family to Clinton Indiana. It’s a relatively small rural community of some 5,000 people, rich in history and with very big energy. But that isn’t anything new, because it has always been that way among the rolling hills, cornfields, beautiful Wabash river and . . . coal mines? Sure enough, at the dawning of the 2oth century mines sprang up (long since gone) in that coal-rich countryside requiring a hearty and dedicated workforce. It was hard and often dangerous work, but that really didn’t matter because the United States was the land of opportunity. Numerous possibilities were seen by many, certainly not afraid of hard work. Overall, there were 28 different nationalities drawn to this unique mid-western melting pot. Given the size of the community, there probably wasn’t a more diverse group of people collected anywhere in the country than in this growing burg in the heart of the Hoosier plains. As years passed, the Italians became the most prominent group of immigrants. With their strong will, intense family values and unparalleled work ethic, their numbers kept growing. To this day the area is still known for its Italian heritage. 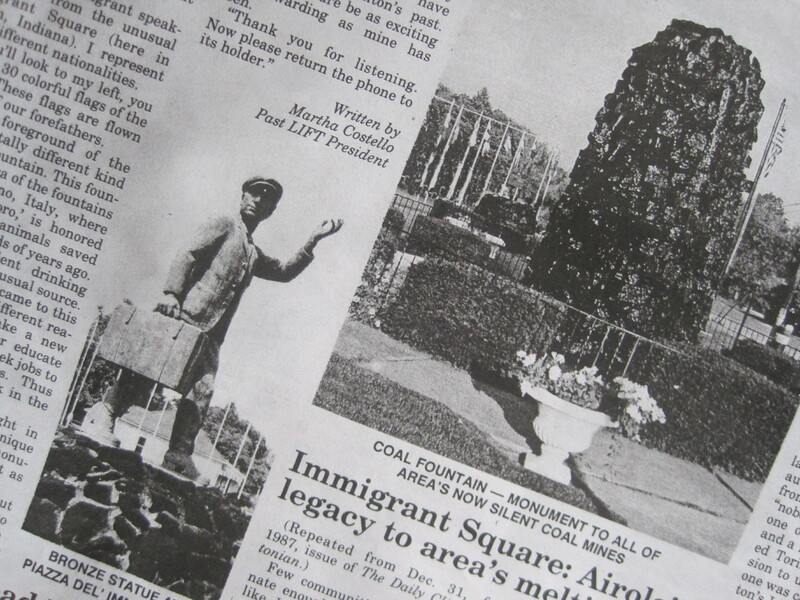 Although many immigrants were originally drawn to work in the mines of western Indiana, those of Italian heritage chose to stay. They put down roots and embraced the mid-west. Those who continue to call it home celebrate the power of both unity and diversity every Labor Day weekend with a festival. Since 1966, Clinton, Indiana has been home to The “Little Italy Festival”, which keeps getting better all the time. 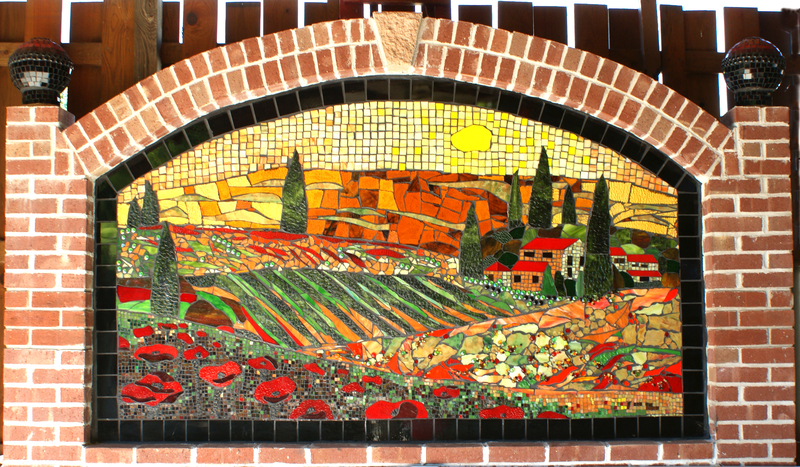 This year, a beautiful colored glass mosaic has been installed in the Wine Garden, depicting an inspiring scene from Tuscany. The artists, Dale Orman and Beth Hoke exemplify the ongoing passion and community spirit that brings the history and culture of Italy one step closer to home. Authentic Gondola – On Wheels? The annual celebration isn’t any regular festa, festival, mind you. The old world charm comes through authentically in numerous ways: the Italian language is liberally scattered throughout publications and in casual conversation; especially commissioned for Clinton’s parade in 1967 is the Venetian Gondola, actually made in Venezia, Venice—a perennial favorite in the the annual parade; bocce ball tournaments are held in the park; and of course, let’s not forget the grape stomping, which is demonstrated each day of the gala. Everybody gets a chance to participate . . . if they want to have the unmistakable tinge of purple piedi, feet. But even in the midst of the deep Italian traditions, this celebration has taken on its own “Clintonian twist” as seen in various “non traditional” traditions: the crowning of their own local Re e Regina, King and Queen, who “oversee” the festivities; young women are celebrated through the selection of the Grape Queen and her court; various eating contests including dishes of spaghetti, polpette (meatballs), sausage and pizza (we might add that they do this in total disregard for the time honored tradition of Italian “Slow Food”); judging the most authentic baffi, moustaches in town; and of course the “Great Italian Duck Race,” in which 2500 plastic ducks are released on the swift currents of the Wabash River to frantically bob and float their way toward victory. The Festival is four days of fun and games every Labor Day Weekend! As we sit here in Tuscany reading the account of their high energy Italian celebration in Clinton, we have a touch of homesickness. Maybe more like nostalgia for those days when our family was young and involved. We all enjoyed our stay in “Little Italy,” and send our well wishes and sentimental thoughts to all of those dedicated creators and supporters who continue to breathe life into the annual event. But mostly, we pause to recognize that we are really not simply Italians or Americans anymore. We are neither this nor that. Though we originate in one country or another, we share common human experiences. We are a diverse mix of people who bring our own special “twist” to life no matter where it is that we call home. We think Walt Disney had it right—it’s a small small world after all. 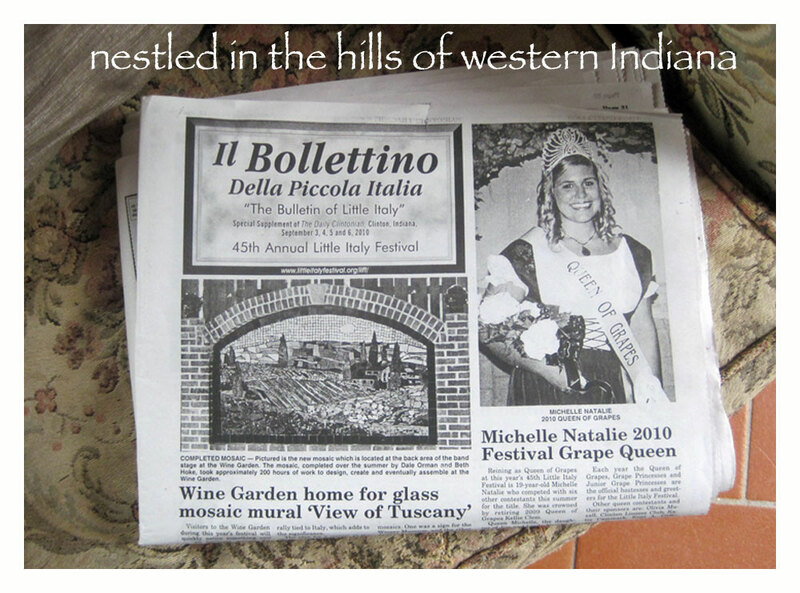 Historical information and photographs were excerpted from Il Bollettino through the generosity of The Daily Cintonian, Clinton Indiana and Diane Waugh—co-publisher of the Clintonian and editor of Il Bollettino. It is always good to look at life and familiar surroundings through another’s eyes. I’m a Clinton native who has compiled much information for the Clinton Coal Town & Railroad Museum. Reading your blog brings the statistics about immigration to life….what diversity there was in the early 1900s in such a small county in west central Indiana. Origins shape our lives, but you are right: what we have in common is more important than our ancestry. That said, I am happy that an Anglo like me gets to experience a bit of Italia every day here in Indiana. Grazie for writing about our community. My husband and friends agree with me: you write artfully and beautifully.